Change is Good – You Go First! You Are Here: Home » Virtual Gastric Band » Change is Good – You Go First! Whenever I think about change I’m reminded of a Dilbert cartoon portraying the corporate environment – Change is good – you go first! We can chuckle because we instinctively know what its saying. Change is going to happen – it’s one of the few certain things in life – but we’d much rather it happens to somebody else first than us and leave us alone. 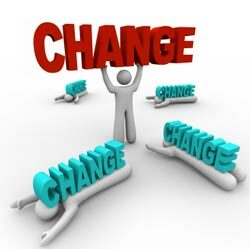 Paradoxically, in the corporate world, the people who bring change to others are usually the worse to embrace change. People, generally, fight change, even when it’s good and necessary because it moves us out of our comfort zone. We may give lip-service to change and even convince ourselves we’re ready for it, but when the “chips are down” our actions don’t support our sentiment. Change in our personal life is no different. It can be difficult and wrenching. I’m particularly reminded of changing habits such as eating healthy foods and portions, or quitting cigarettes, as requiring significant commitment to change. As a hypnotherapist, and especially since offering the Virtual Gastric Band in Massachusetts, I decided to work with people who not only wanted significant change in life but also were serious and realistic about what it would take, and the shift in their attitude it could take to be successful. In many respects, hypnotherapists share the change agent skills required in the corporate world. They need to understand people’s fears and concerns, and desire to hang onto habits, but also provide the resources those same people need to leave those habits behind and move forward. I recently captured in an article what it takes to be successful at making change here. It’s a quick read and I hope it will help you determine if you’re ready for the Virtual Gastric Band Procedure so it will be successful for you. I’d love to hear your experiences about change and what has worked for you in the past so please use the comment section at the end of the post to provide feedback to me.